This is a set of 3 dollhouse miniature handmade plastic food trays. Entirely handmade by me! Looks extremely professional - glossy in appearance yet it is thin but sturdy. Does not break if you drop it as it is made of plastic. 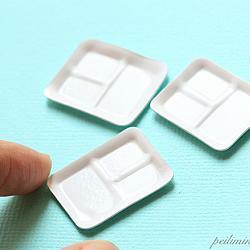 Use these trays to make dollhouse miniature set meals! As these are all individually handmade, please note that the measurements for each may slightly differ from one another. There may also be some slight imperfections as they are handmade, but I always check its quality before I mail it out. Tray measures approximately 2.7cm by 2.2cm. 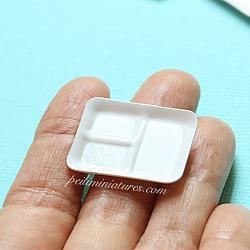 It is perfect for 1 inch scale dollhouse miniature needs. 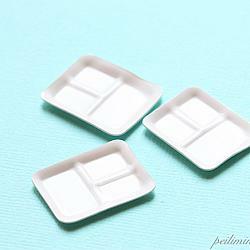 This listing is for 3 handmade dollhouse miniature plastic food trays.